Facebook has been into disaster recovery mode after the Cambridge Analytica case became trending in media, but it seems the company has lots of hidden unethical secrets to reveal. In a recent revelation, the company has been found guilty of collecting call logs and text data from Android users for long time. 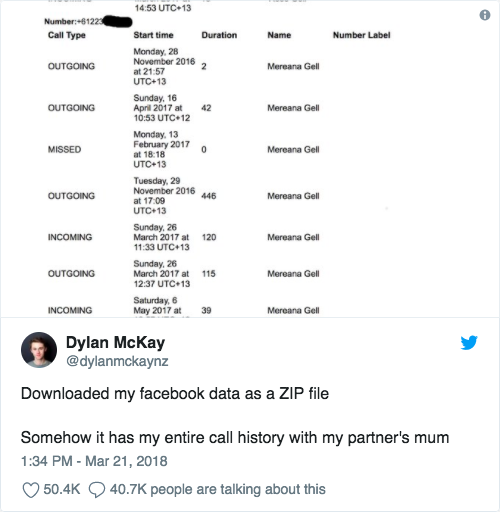 A Twitter user Dylan McKay (@dylanmckaynz) posted several screenshots showcasing how Facebook was collecting calls and SMS data for years. The could show use the details including call type, start time, duration and name of contact it was made. The same kind of thing was for SMS even if the person was not using messenger for SMS. It had every cellular call he had ever made and metadata about every text message sent or received. When asked by ArsTechnica, the company said that the data was used as part of its friend recommendation algorithm. Later the company published a detailed blog post explains how and why it was collecting the data and how users can turn it off in settings. Facebook Messenger is not just a messenger for the social network but the app also has an option to make it default SMS app on Android. So, the app can get access to user contacts and phone app data. But the issue is bigger. Even if you do not grant permission of collecting call log data, it was still collecting data for years. Now the Messenger app asks for the permission to access call logs and SMS. This explicit permission feature on Android is still new and was introduced with Marshmallow (Version 6.0) in 2015. Earlier with Android apps, users had to grant permission to all the features which the app wanted to access even if it was not essential to the app. So, users were forced to allow app to access everything to use the app. Facebook app before Android 4.1 also got access to call and message logs by default. ArsTechnica also noted that any other app can avoid the newer rules of explicit permission by writing the app to an earlier version of the Android API. The worse thing is that Facebook never explicitly revealed that the call data was being collected before 2016 because the permission asking feature came only in 2016. So, the company has been collecting the data without even telling you properly. It appears that iOS users are safe and Facebook app didn’t get access to the call logs on iOS due to strict access policies by App. Facebook denied logging of data and claims that they never sold this data and they do not collect the content of text messages or calls. It claims that users information are securely stored.